At 8:00 am you leave Hue city for Quang Binh Province and pass through Quang Tri and experience a story of DMZ which is famous in Vietnam War, you will pass through Hien Luong Bridge and Ben Hai River. The driver transfers you to Paradise Cave Ho Chi Minh trail – a legend one during Vietnam & American war for you to have more knowledge of this area and the name of this trail. After lunch, you will be transferred to visit Paradise cave for visiting which named Thien Duong in Vietnamese. 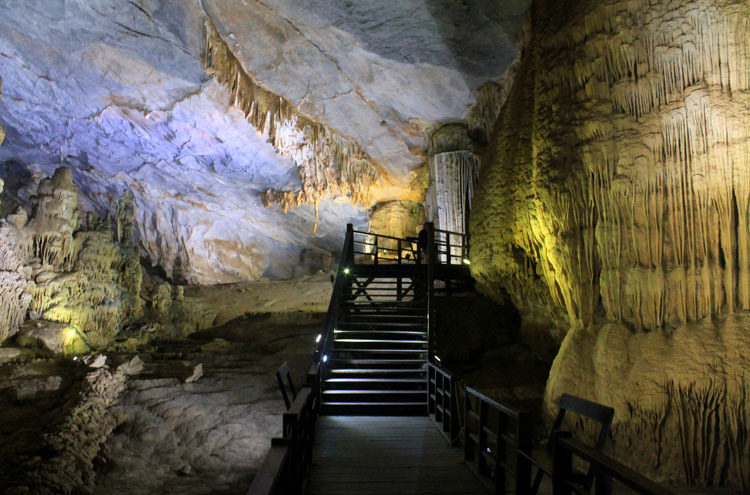 It is the largest dry cave in Phong Nha Ke Bang National Park, especially its size and unique of stalactites and lime stones. To reach the gate of cave you need to have golf transfer through the old forest where you have opportunity to see valuable trees. It is your surprise for stalagmite structure inside which nature bless for this cave. Next, you will enjoy the Zipline to discover Dark Cave where the water is green all year round and always cold. It is an interesting when you make zipline to swim on the river and see a part ecosystem in Phong Nha cave and national park. Besides, you also make a kayaking on Chay River to survey the nice view as well as get more knowledge. In addition, you will have chance to relax with muth bathing. After having breakfast at homestay. Transfer you to Phong Nha – Ke Bang to discover the mysterious depth 4.500m of Phong Nha Cave with nature beauty on stalactites with the wonderful sights including beautiful limestone formations in different shapes as your imagination…it’s excited. Before starting at 09:00 am, you will heard about traveling itinerary, notice about safe of health during discovery and you will receive the specialized equipments such as head flash-light, shoes, helmet, swimming clothes…Firstly, you will boat trip (kayaking) through the longest underground river on the world and Phong Nha Caves – World Nature Heritage Site, coming here you will see beautiful and sparkling stalactite and survey the life of shrimp, fish, bat…Not far from cave entrance is intermediary area about 1,2 km. This area had been fitted up with light, after this place the dark appears and no light anymore within 500m. There are some wires is fitted up to make tourist safe as you will hold firmly on it when moving. You will move slowly to contemplate the impressive shapes of stalactite inside. After pas through first 1km of darkness region, you will have a picnic lunch. After lunch, you will continue kayak inside the cave and have to swim also. After swimming about 200m, you will reach a nice sand-bank; from this place, you will swim and walk on the nice sand-bank. The tour guide will connect a wire from this place to another place of river and tourist will cross river with it because the stream run very fast. Here, the cave is bigger, higher, In this cave, “Xuyen Son Ho” Cave is biggest one. At 04:00 pm, you will finish discovery 4,5 km of Phong Nha Cave. Leave Phong Nha cave, our driver will transfer you back to Hue City in the late afternoon. Arrive in Hue city around 20.00. VIEW MORE: "Quang Binh Tours"